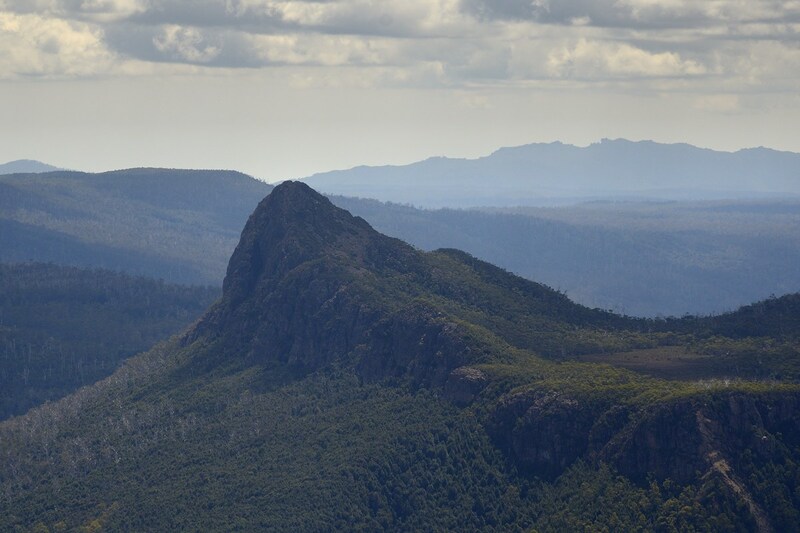 Mt Pillinger lies to the east of the Overland Track and provides spectacular views (1MB jpg) of the main peaks along that route, as well as many other peaks of the Central Plateau and northern Tasmania. This is a moderate daywalk and well worth the effort. The walk should take 2 to 2 1/2 hours one-way, but this will depend on how quickly you climb steep hills. Slower climbers should allow more time. You will also need to allow extra time for sitting on top soaking in the view. The walk commences from the very end of the Arm River Road; the first part of the walk is along the standard walk-in to Pelion Hut. Drive to Mole Creek and then heading west out of the town take the Mersey Forest Road. About 35 km from the middle of Mole Creek, you turn right into Maggs Road (signed to Arm River), and then after a further 2.5 km fork right into Arm River Road. Follow the road to its end. There isn't a great deal of parking - try to park so that others can too. The summit is at 1280 m, and in poor weather the approach and climb would be unpleasant – as for all Tasmanian walks, take warm and waterproof clothing. Some of the slopes are steep and bouldery, so some care is required. Mobile phones on the Telstra network operate from the higher parts of the peak. From the carpark, the track first heads through the forest and is fairly level for a short distance before climbing steeply to the plateau. Once the track has levelled out, you will come across a fork. The main track goes right, and a more minor pad heads left. Someone has placed some sticks across the minor track, and I'm not sure if perhaps there is a later turnoff to the Mt Pillinger walk. Anyway, you can head left, and the track undulates and winds along a pleasant valley. Keep going until you find a substantial cairn (GPS Ref. S 41 48.404 E 146 07.802) and can see a reedy lake ahead. The track now turns left and heads uphill and is easy to follow all the way to the top although some sections are steep and/or bouldery. The track first heads roughly southeast, then turns through roughly southwest before turning west and climbing steeply and more directly to the summit. The views open up, and from the top there is a very spectacular view of many of the peaks of the Overland Track and Central Plateau. At 1:100,000 you can use either the Mersey (8114) sheet or the Cradle Mountain - Lake St Clair National park map. At 1:25,000 you will need the Rowallan (4237) and Cathedral (4236) mapsheets. The Abels Volume 1 contains a description. John Chapman also covers this walk as a sidetrip in his Cradle Mountain - Lake St Clair Guide. See also my post about my walk to Mount Pillinger in February 2013.